Sydney Shop Girl: Quiet Time. The Weeknight Book Club: 'The Heart Goes Last' by Margaret Atwood. Quiet Time. The Weeknight Book Club: 'The Heart Goes Last' by Margaret Atwood. Dressed up my mug of Moccona this morning in my silicon lidded mug. It almost looks like it came from a cafe. Almost. I'm just sitting here in front of my computer sipping a cup of instant coffee listening to time go by. The clock's ticking away in a sleeping (for now) Toddler SSG's room, cars are purring along the street trying to secure one of those precious free street parking spots that come with bonus shade from the trees, an electric fan is humming gently as it delivers puffs of cool air into what is already a warm summer's morning. There's nothing that needs doing urgently. Nothing that needs to be planned ahead for in my head or on my phone diary. It's just me, my coffee and my thoughts. In no particular order of priority. And all I have to write about are little details of the everyday. Remember my bunch of spring onion roots that I planted over the weekend? Well, here they are 5 days later! Who knew they would grow so quickly? Or that they would do so under the care of my thumbs? In slightly more exciting news, I've discovered a new source for post gym coffee at The Junction. The Bondi Juice Company do excellent shots of Allpress coffee and the barista doing Tuesday mornings is chirpy, energetic yet also relaxed. He's totally Bondi and just the person you need to be making your coffee after you've survived an epic battle with a treadmill. I've decided to be proactive about the post cardio munchies. I've stocked up my gym back with puffed rice sticks and a jar of fruit and nut mix. I know, I don't know what happened to my protein shake mix, raw food energy balls or low carb energy bars either. Someone must have pinched them. Along with my single serve wheat grass shots... Being facetious, I know. I really should give one of them a try one day rather than teasing them. Where should I start? My big mental block about them is taste. What tastes most like 'normal' food or is that missing the point? 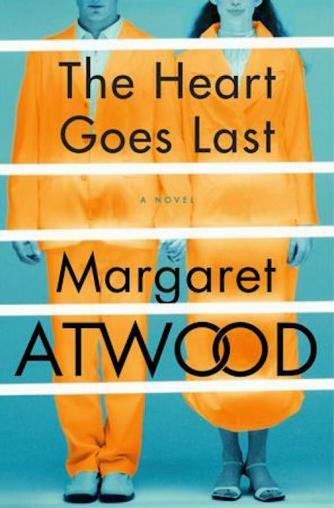 'The Heart Goes Last' is Margaret Atwood's latest novel. It's a crazy, surreal, disturbing and humorous read. I don't think Atwood is capable of writing a less than sparkling sentence. It's her lyrical, deceptively simple in parts and cleverly paced turn of phrase that kept me reading through some of the kookier places that Atwood takes her characters in this dystopian novel set in a time in the future in a world mostly ruined by financial crises and humanity's morbid obsession with a computer generated and dominated world. We first meet Stan and Charmaine at a phase of their marriage where the honeymoon is well and truly over. The tans from that post wedding vacation to the beach have faded long ago, money is tight, the hopes for a brilliant shared future spent side by side have all but gone as they spend their nights sleeping in their car and their days in search of food and public toilets. Both have lost their jobs in the financial crisis and seemingly overnight, lost their house and their financial security. And then the Atwood style twisted fairytale begins to crystallise. Stan and Charmaine chance upon an opportunity to be part of a futuristic society that has been created to give people like them new lives in an experimental city where all their physical needs will be met - food, shelter, hot water, electricity, real jobs. But there is a price to be paid for this fresh start. Stan and Charmaine would need to effectively lead two lives - spending one month 'on the inside' in a kind of community prison where they would do various jobs to support the 'actual' prisoners in return for a month as 'free people' in their own home. Their house 'on the outside' is shared with another couple of 'Alternates' who would occupy the house in a kind of time share arrangement. Things run smoothly for a few months as Stan and Charmaine luxuriate in everything they had been missing in their time as homeless people. They follow the strict rules about not having any contact with their Alternates. Sure it's a strange set up, but they have gotten so much in return for the inconvenience. Because, at the beginning, that's all it is. A little inconvenient. Then Charmaine gets a bit bored and starts an affair with one of the Alternates. Stan's suspicions are raised and he begins a little project of his own to track and monitor Charmaine's activities. In the background, life in the community is also changing and becoming a little more sinister. There's a large influx of 'real' prisoners into the community and the real purpose of Charmaine's job in administering 'medication' to them becomes clear (as does the title of the novel). Atwood brings all kinds of confronting themes into the way the community functions. She touches on human and robotic trafficking (when you discover why the blue knitted teddy bears are being made, you will probably stop reading for a moment as a wave of revulsion passes through you), the grey ethical areas of just what kind of neurosurgery humans have 'a right' to perform on others and how anyone trying to be God and creating robots in the perfect image of humans is never going to end well. Media reviews of 'The Heart Goes Last' have been more critical than glowing. I'm linking to a detailed review here from The New York Times. Personally, I just went with the crazy flow of 'The Heart Goes Last' and enjoyed the trip. Before turning the last page, having a bit of lie down and then having a bit of a think about what I just read. Have you read 'The Heart Goes Last'? Enjoy the trip? Did it make you think? The ending of THGL stumped me. I would've liked to know what happened to Stan and Charmaine on the outside. Other than that, I love Margaret Attwood. Have you read the MADDADDAM trilogy? No but I will go and find them! You'll love the MaddAddam trilogy, SSG! Book 1 had me hooked in. I read Margaret Atwood's A Heart Goes Last...recently...I am amazed that she can still write a fabulous novel that is not a formula writing...it was rather risky and fresh. She is a creative writer of the first order. Risky and fresh! Well said! I'm very impressed by your green thumbs. Just look at those spring onions go! Looks like you'll be home growing all your salad based needs before you know it. I'm currently avoiding dystopian books because I find them too much to deal with at the moment, but Margaret Atwood is such a brilliant author that when I'm up to it I think I'll give this one a go. It does sound like a great read.